I did not think too much about it, at first, because I thought it would be one of those easy tasks that did not take a lot of effort. When the tablets needed to be charged, I would just plug them in. It all seemed so simple. I suddenly found myself wondering how was I going to do this, and where on earth do I put them in my already crowded classroom? The minor problem came when I realized that I did not have enough power strips on hand. I called my teammate, Beth, and asked if she had some that I could use. Thank goodness for the IT department for having a secret stash of odds and ends for technological emergencies! With her spares, I had enough to set up charging stations all over my classroom on any horizontal or vertical surface that was available. Before I could actually start plugging them in and charging them, my next task was to remove each charger from its box and take off the plastic bags and ties. After I got the USB cables plugged into the charging units, the tablets were finally ready to be charged. As I started this task, my college-aged son, Stephen, stopped by my classroom to lend me a hand. He helped me find a few more open outlets for the power strips, and we got them all plugged in and charging in less than 10 minutes. 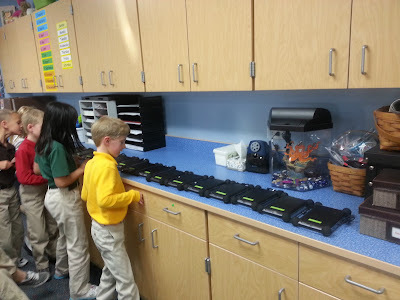 They were scattered all over my classroom, but each tablet had a home to charge. My “Oh, no!” moment was no more! I had mentioned in an earlier post that it was important that I have identification names and numbers on all of the tablets. This was done to prevent major “Oh, no!” moments. Since my school does ability grouping for math and reading, my class decided that we should share our tablets with the other second graders who have me as their math and reading teacher. Doing this has allowed me to put the Nexus 7’s into the hands of close to 75 second grade students! This kind gesture made the other second grade classes very happy. By assigning each guest student a specific tablet, I have made all of them accountable for using them. This, along with adding LanSchool to each tablet, has made the students very aware of computer security. It also prevents 25 students from asking me all at the same time as to which one they should use! A funny moment happened one day when I heard an “Oh, no!” from one of my homeroom students when she was looking at her photos in her photo gallery. She brought her tablet over to me to see. One of the guest students assigned to her tablet had been exploring the camera feature while usng her tablet and snapped a self portrait. My homeroom student remarked, “Well, it is okay, Mrs. Stewart. She took a really good picutre, and now you don’t need to show her how to use the camera. She will be an expert pretty soon.” All I could do was smile! This is the kind of moment that makes this teacher pretty darn happy. My next post will be showcasing some of the work the students have done out in the field using their tablets and the camera to show their creative “wow” moments. You will be amazed at what they did with just a few minutes of instruction on using the camera feature and being set free on their photo safari in and around our school. Cross posted from the EdTechTeam blog. YEAH!!!! 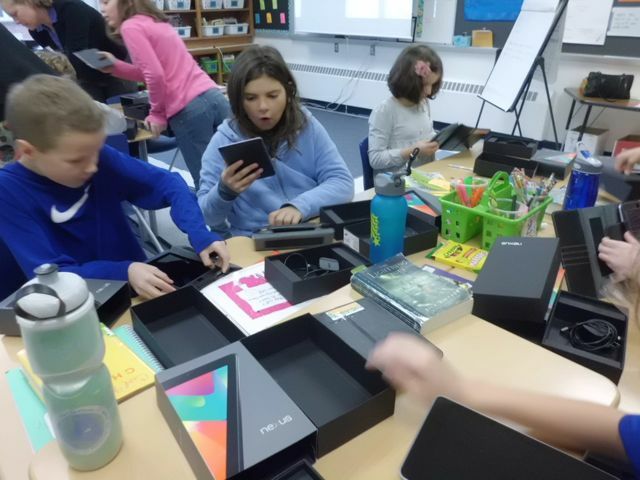 The Nexus 7s arrived in Maine on Friday afternoon and we were able to give them to students just three days later. Kate Parkin (4th grade teacher) and I had spent time preparing for the devices, exploring apps, becoming familiar with various resources like Edutecher and Android4Schools and thinking about how to bring this to her students in the most productive way. Some weekend work went into charging, updating and preparing the tablets with each student’s Yarmouth Google account. Do any of you know of any schools purchasing Nexus 7s for student use? We’d love to connect with the educators in those schools as well – to share challenges and best practices. Thank you in advance for any comments you might leave. Over the past few years I’ve found that my personal and professional values have more or less converged, so I’m particularly passionate about my commitment to these values… and I think they’re a good fit for this team. We do only work that we are passionate about. Don’t accept a job from the team that you aren’t passionate about. Do feel free to send us leads you’re not passionate about, but know that I won’t move on a lead unless I am passionate about it… or unless I know someone else on the team that is. It follows that we also don’t provide or recommend products or services that we are not passionate about. Sticking to your passions is also a very positive way to ensure you never threaten your own integrity. We are a flexible team. This is probably the essence of the EdTechTeam, and I often pitch this benefit to clients: “We are a nimble organization, able to be flexible and responsive to your needs… Our services can be scaled up or back as necessary, and we are experienced in developing custom services based on client requests. Because we always work on a contract basis, few of the commitments required to hire an employee are necessary for your organization to tap into our expertise.” I value flexibility over systems, rules, and precedents – and I value flexibility over checklists, goals, and plans. Flexibility is critical to the philosophy of the “lean startup” and that philosophy is key to our success and future growth. If I say “thank you for your flexibility” it is high praise coming from me. We are an open team. I mean this in many ways. Most importantly, we are open with each other. Hopefully this message is a good step toward making that even more of a reality. If you have questions, concerns, or potential conflicts… let me (and anyone else involved) know. We are also open with the clients, educators, and students that we serve; we always share our opinions (and identify them as such); we always disclose potential conflicts of interest; and we always disclose any additional funding or support we might be receiving. And, of course, we always thank the people and organizations that have contributed to successful events and projects. Also, we share as much of our resources as we can. That is why all of our workshop resources and publicly posted materials (including blog posts and wikis) are released under a Creative Commons Attribution-ShareAlike license. We’re paying it forward to other educators and learners. We are a creative team. Creativity is a cornerstone of my educational philosophy. I believe that encouraging creativity is both a means for learning other things, and a valuable end for education to aspire to. I value working with creative people (like all of you), and our creative solutions to others’ problems are in a very real way what we are selling. We find creative ways to help people learn. Simplicity is good. All things being equal, simplicity is better than complexity. Simple solutions are better than complex solutions. Simple tools are better than complex tools. Simple rules of thumb are better than complex manuals, and simple values are better than complex contracts. If in any case, a simpler tool can be used, simpler words will suffice, or a simpler route can be taken… we should always choose the most simple path to the solution we want. I feel my language in this message is simple, but I know it is still unnecessarily long and complex. I look forward to the day I’ll be able to express these things in only a few lines. We live healthy, balanced, and authentic lives. I mentioned that my personal and professional values have converged over the years. These are three values (collected for simplicity’s sake) that I aspire to in my personal life, that I admire in many of you, and that we should look to for guidance as a team. We should not suggest things to clients, educators, and learners that would not be healthy or that would lead them to lead an unbalanced or inauthentic life; rather, we should encourage healthy choices, balanced behaviors, and authentic communication. I’m a fan of teaching “the whole child” (regardless of the political baggage this term may have acquired), and I think it is critically important to always deal with everyone, educators and students included, first as people. Discover their passions and their challenges if you truly want to help. The technology in our name and mission does not outweigh the health and happiness of the people we serve. We donate 5% of our net income to put devices in the hands of students. As I’ve worked to reboot this business in 2012, I’ve wanted to ensure that giving is baked right into the business model. (Among other things, I was inspired by Blake Mycoskie’s Start Something That Matters.) When I asked myself what we could do, I kept coming back to the importance of putting devices in the hands of kids… to creating as many 1:1 situations as we can (even on an individual scale). We can’t offer any sort of 1-for-1 deal similar to Mycoskie’s TOMS shoes (it would be too expense to include the price of a mobile device with every workshop ticket… or to give away a workshop for each one sold), but we can dedicate 5% of our net profit to putting devices in kids hands. Inspired by Warren Dale, who provides some very convincing arguments for giving kids iPod Touches (which they will carry and use everywhere) I am giving iPod Touches to kids in schools with teachers (and visionary educational technologists) who will provide the best chance for the devices to be put to good use. UPDATE: The entire core team for the Google Apps for Education Summits has committed to giving away Nexus 7 devices… and I just shipped our second class set yesterday! We embrace synchronicity. Whatever cause or causes have brought all of us together, there is no doubt in my mind that this team is greater than the sum of it’s parts – that I am better working with you than I am working alone. Similarly, I trust my intuition… and I trust yours; your opinions and insights are extremely valuable to me. As a team, we should continue to embrace the happy accidents and meaningful connections that our work presents us with. I look forward to seeing how our efforts will be shaped in the months and years to come. Yesterday we hosted a Google+ Hangout OnAir to promote the Google Apps for Education California Summit in Santa Clara, July 12 & 13. Our special guests were Day 2 Keynote Speaker Dan Russell, Ph.D. , spotlight speaker Rushton Hurley, and committee members Jim Sill and Molly Schroeder. Each of them shared a brief bio, and then a tip or philosophy from the session(s) they’ll be leading at the summit. It was a great Hangout, and I think, a great taste of what it will be like to be at the summit with all of these people – and hundreds more like them. We hope you’ll join us. But more importantly, this Hangout was also a great learning experience. For those who need to be brought up to speed… Google+ is Google’s new social network (coming up on a year old publicly). A Hangout is a feature of Google+ that lets up to 10 users video chat simultaneously. It also allows screensharing (and other add on “apps”), making it a powerful tool for learning. An OnAir Hangout is also broadcast for other viewers (who can leave text comments to interact with the Hangout participants) and recorded for future use. The OnAir feature is still only handed out to celebrities, public figures, and Google+ users with many followers. I received my access from the Google Apps EDU team. Happily, learning by trial and error (and “lead learning”) was something of a theme of the discussion during the hangout. John Hall, a potential attendee at the summit, joined us and let us know he was just learning about Google+ Hangouts, and I assured him that so were we. (I even mistakenly said I’d just learned that you can’t screenshare as an OnAir host.) Jim had to pull the “cooking show” maneuver to show off a finished product of a demo he tried live but didn’t come together in time (he was sharing Google Calendar . And even Dan tried to show me a trick in Google Books, which wound up not working… but it led us to discover another that did. Also, JUST NOW I tried to launch another Hangout OnAir (to test something) and wasn’t able to until verifying my YouTube account (via SMS). My account is now able to upload clips longer than 15 minutes. Apparently I was able to do that yesterday via Hangouts OnAir, but it appears I can now do that even through YouTube’s upload interface. Cool. I hope this post might be helpful to some of you… and I hope many of you might consider joining us at the summit in Santa Rosa this July 12th and 13th. We’ve also got summits planned for 2012-2013 in Mexico City, New Zealand, Hawaii, Australia, Singapore, the UK, and elsewhere around the US and the world. Each of these includes speakers and support from Google – and the potential for touring local Google Offices. Be sure to subscribe to this blog for announcements and updates, or follow us on Google+ and Twitter. The EdTechTeam has just finished a busy week at the Computer Using Educators 2012 Annual Conference. Many of our workshop resources are available for free online (under a Creative Commons Attribution-ShareAlike license). We hope you’ll use these, and share them with your colleagues and students. Let us know in the comments if you have any questions about these workshops – or anything to add to the resources. And, of course, contact us or fill out the online request form if you’re interested in bringing these workshops to your organization or your region. Happening Now: Personal Learning Networks for Educators. Please share – why do you connect with other educators online? What do you get out of it? Of course, I’m not ready to give up inboxes, labels, filters, stars and all that Gmail goodness… but this is an interesting trend for me personally. Gonna grab a late dinner soon at #clssouth. Awesome. I’ll definitely use this for event planning calls.